My 6-year-old son loves going to Market Market to ride motorbikes and to mingle with other kids in the playground. Two Saturdays ago, he asked his Dad if we could go to Market Market because he wanted to play there. 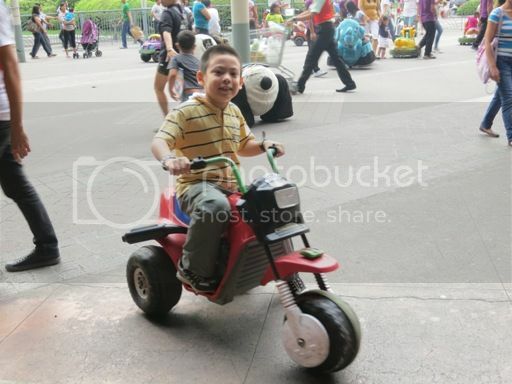 His wish was granted, and he got to spend 40 minutes riding a kiddie motorbike of his choice. We paid Php200 all in all because each 5-minute ride cost Php25.00. And then we went for a stroll around Bonifacio Global City. 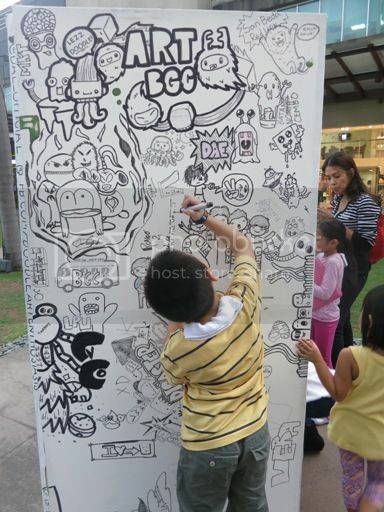 We chanced upon this big white board in BGC called “Art BGC” where the kids and the kids at heart were allowed to draw and doodle. He won’t leave until he was able to finally get hold of the marker that he would use to scribble and sketch. And then it was time to eat. We had dinner at P.F. Chang’s, but that deserves another blog post. This entry was posted in Bonifacio Global City, Doodles, Market! Market!, Motorbikes. Bookmark the permalink.